Production is the final step in the e-discovery process flow. This is the action where you “produce” all the documents after review for other parties. Generally there is some agreed upon production format and standards between the parties. GoldFynch can account for most situations. Once you are done reviewing, culling, redacting and tagging your files, you are ready to produce. Production in GoldFynch, just like everything else, is designed to be simple and is handled by a production wizard that will walk you through all the steps. To get started click the “Production” link on the left window pane. Once you do that the Production Wizard will take over and guide you the rest of the way. The tags you created for the documents as part of the review process will appear in the tags list, with the number of documents. In this case the tag being “production tag” as an example. 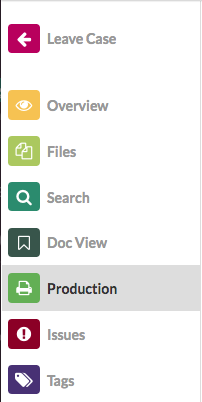 Step 3: Lists the most common production options. The final step lists all the files in the production set. In this step you have the option of producing the file in its native format, by clicking “native” or removing a file, by clicking “cull”. When you click the “Finalize and Produce” button, you have the option of entering Bates numbers. Clicking the “Produce” button will send the production to the production queue system. When your production is complete it will be available under the “Recent Productions” heading. Any pending productions will be under the “Incomplete Productions” heading. Any errors with productions will be detected by the GoldFynch team and you will be contacted about the fixes. The final production will be available in the form of a downloadable zip file.